Poetry. 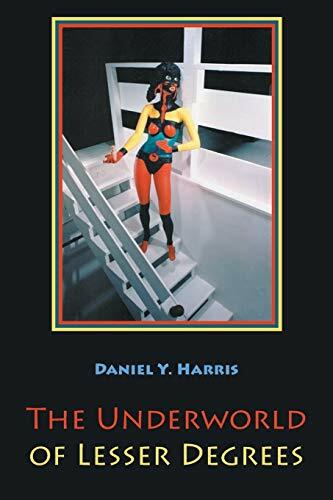 THE UNDERWORLD OF LESSER DEGREES by Daniel Y. Harris is a post-digital and post-human literary oeuvre whose vortices are replete with the language of kabbalah, alchemy, holy writ, and the nuances of digital technology and social media. In illuminating a wide array of literary styles and varied poesis, THE UNDERWORLD OF LESSER DEGREES balances an amalgam between nihilism and transcendentalism by burrowing through the minutiae of self and identity to conjure the image of a post-human self as an inventor, engraving tropes of originality from the littered density of the literary canon. The book scrapes the periphery of form and style, but not to extol a certain impossible obscurity, futility, abstraction, disdain, flippancy, or the realpolitik of viral media. Technology and hyperreality meet Judaic midrash and biblical exegesis in stanzas which seek to create a human being from the refuse of bandwidth. THE UNDERWORLD OF LESSER DEGREES for a new spiritus, geist and religious ethos for the 21st century. Daniel Y. Harris is the author of <em>Esophagus Writ</em> (with Rupert M. Loydell, The Knives Forks and Spoons Press, 2014), HYPERLINKS OF ANXIETY (Cervena Barva Press, 2013), THE NEW ARCANA (with John Amen, NYQ Books, 2012), <em>Paul Celan and the Messiah's Broken Levered Tongue</em> (with Adam Shechter, Cervena Barva Press, 2010; picked by <em>the J.</em> as one of the 5 most important Jewish poetry books of 2010) and <em>Unio Mystica</em> (Cross-Cultural communications, 2009). His poetry, experimental writing, art, and essays have been published in <em>BlazeVOX</em>, <em>Denver Quarterly</em>, <em>European Judaism</em>, <em>Exquisite Corpse</em>, <em>The New York Quarterly</em>, <em>In Posse Review</em>, <em>The Pedestal Magazine</em> and <em>Poetry Magazine.com</em>. He is the President of NYQ.